An important part of scientific investigations is observation. When you conduct an experiment, you observe what happens during the course of our experiment. You write down what you see so that you can use those observations to draw a conclusion. Observations are, also, important when you are doing an animal or nature study. Those studies usually do not require experiments. They rely on what the scientist sees, hears, smells, feels, and sometimes tastes. When observing nature, there are several ways to record your findings. You can take notes, take photographs or video, record sounds, or sketch what you see. Often, these sketches are most important. Sometimes it is hard to put into words what you are seeing and drawing it is easier. Photographs aren’t always the highest quality and some details get blurred or missed. Sketching, drawing, or painting nature allows the observer to not only add details to what they see and where they see it, but it allows a bit of personality to show through. While looking at a patch of wild flowers, one observer might draw all the different flowers and grasses they see and another observer might hone in on one flower in particular and add all its details. Another observer might be more interested in the honey bee moving from bloom to bloom. All of these records of the wild flower patch are correct, as long as the observer didn’t add to what was actually present at the time. These different drawings can tell us what is important to the person drawing them and what interests them most. Sketching nature, also, gives those who find science to structured a creative outlet. It allows them to see the beauty of nature and how their creativity can be used to study it. A good teacher can use nature sketches to guide students into deeper learning opportunities. Students will want to learn more about what interests them. In our homeschool, we use art in our nature studies from when the kids are small through high school. We sketch sketch while in the woods or on a field trip to the botanical gardens or in the backyard. We paint or use chalk pastels to add color when we return. This adds a deeper understanding to our subjects and helps to develop an appreciation of nature. Another way we like to incorporate art into our nature study is through art tutorials. When the kids find a topic that they are interested in or during a unit study, I like to find art tutorials to teach the kids how to better represent what they are studying. Birds are a common subject of study around here and we have used art in our bird study many times. The kids are decent artists anyway, but when we added a chalk pastel bird tutorial their birds really came alive. Plus, the kids enjoyed their art more when their creations started to look like real life! Recently, we have been doing an ocean/beach unit study in preparation to our family vacation to the beach. We’ve studied waves, sand dollars, sea shells, sea turtles, and ocean animals. Out of all the topics we have touched upon in our study, both kids have found a new interest in manatees. 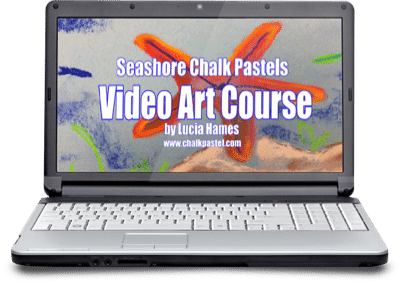 I had already decided to use the Seashore Chalk Pastel Video Course and ebook during our study, but when I saw that it included a manatee tutorial, we started there. We add art by visiting our local art studio for painting classes once a month! We have a great drop in art gallery near us that we have gone to for years. They have a theme each week and the resident artist is always on hand to give a short lesson and guidance. I have really struggled to incorporate art into our homeschool because it is such a weakness of mine. Chalk pastels and the tutorials have been life changing! My 6 and 10 year olds love them! Art is not my strength and often gets thrown to the side. Tutorials are the only thing that saves me. Thanks for sharing! Charlotte Mason always included art in her nature journals, so we’ve done art in ours, too! We add art in a similar manner to you: through nature study, with tutorials added as we feel inclined. With 5 family members all on different skill levels, this fits everyone’s needs while making sure that we each grow and improve as artists. I am looking for new ways to add more art to our curriculum for next year. We have only done a few classes this year. You are here: Home / Resources / Why Add Art To Your Nature Study?